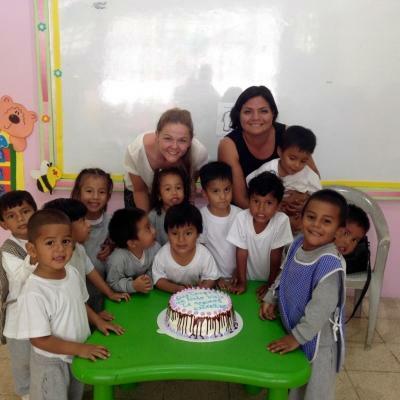 Volunteer with children in Ecuador and help promote early childhood development. You can help us give children the skills they need to succeed at school. You’ll also teach basic English and make sure that children practice good hygiene everyday. By volunteering with children in the Galapagos, you’ll support teachers in overcrowded classrooms. You’ll help with their lessons and you’ll be able to give more individual attention to children in small groups. The more volunteers we have, the more children can get the individual support they need. This is a great way to travel and gain practical childcare experience, all while making a difference. 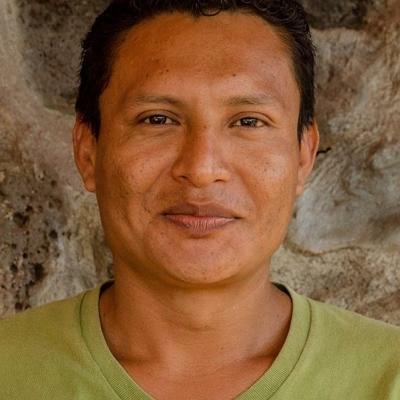 You’ll live in shared accommodation with other volunteers and interns on the tiny island of San Cristobal in the Galapagos. You can also request to stay with a host family. 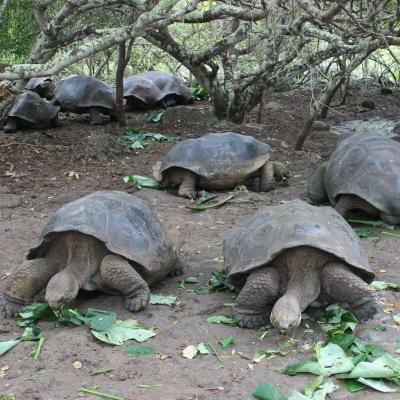 This is a unique opportunity to get an incredible insight into the lives of Galapagos locals! Is volunteer work with children in Ecuador right for me? If you’re energetic, fun-loving, and have loads of patience with little ones, you’re the perfect fit to volunteer with children in Ecuador. You’ll gain hands-on childcare experience, and develop your personal skills, like communication and planning. This can help your future career. Best of all? You’ll become part of our ongoing efforts to help children in the Galapagos. No experience in childcare? No problem! You will be supporting the local teachers and caregivers and have Projects Abroad staff members close at hand to help guide you along. We also provide training, workshops, and lesson planning resources. Our Childcare Project in Ecuador runs year round, and you can join at any time from a minimum of two weeks. We recommend staying longer so you can have a bigger impact on the children. Your main role as a Childcare volunteer in Ecuador is to help kindergarten teachers give individual attention to as many children as possible. It’s important to have an element of fun in each of these activities, as children learn best through play. 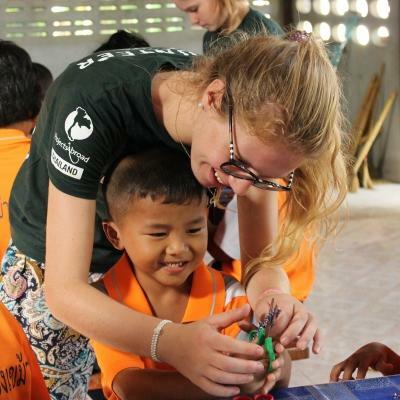 We also encourage volunteers to work closely with small groups of kids. This will help you identify areas that need further development. Galapagos is a tourism hot spot. When locals have a good grasp of English, they can conduct better business and live more prosperously. You can help lay a foundation from an early age by teaching the alphabet, having conversation sessions, and reading English books to the children. An important part of your role is to encourage children to practice good hygiene everyday. You can help improve hygiene by teaching them how to brush their teeth properly and to wash their hands regularly throughout the day. Make this fun with songs, games, and little class challenges. Due to a lack of designated facilities in Galapagos, children with special needs are often enrolled in mainstream schools. You can help the local teacher by providing personalised support and stimulation to assist these children in keeping up with the rest of the class. For all of these activities, we’ll give you training, workshops, and resources to help you do the best job possible. Where will I be working in Ecuador? You’ll live and work on the island of San Cristobal. It forms part of the Galapagos archipelago, located about 1,000km from mainland Ecuador in the Pacific Ocean. 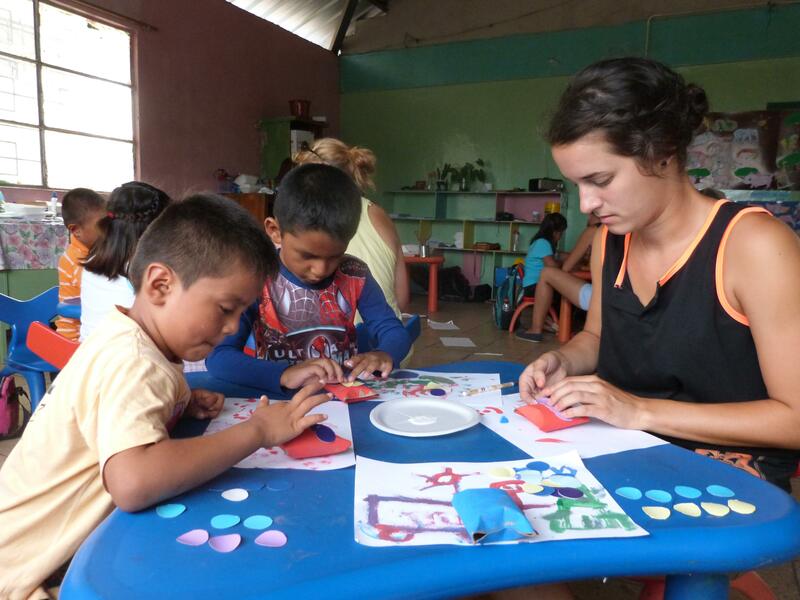 Our volunteer placements are all at kindergartens in the town of Puerto Baquerizo Moreno. Conditions are most basic than what you’re used to. Even though it is the capital of Ecuador’s Galapagos province, Puerto Baquerizo Moreno is still more of a port town than a city. It’s home to several pristine white beaches, but only two are for people. The others are all devoted to the protection of the local sea lion population. With many cobbled streets and an attractive wharf area, Puerto Baquerizo Moreno is a charming village, with much to explore during your evenings off. What will my typical day look like while working with children in Ecuador? You will start your day with breakfast, prepared by and enjoyed with your host family. After this, you’ll walk to your placement. On your first day, Projects Abroad staff will accompany you to show you the way. Your work day will usually run from around 8:30am to 3:00pm. During the morning session, you’ll help teachers in class by assisting with lessons. You’ll also work closely with small groups of children who may be struggling with specific tasks. You can head back home for lunch. Alternatively, you can arrange with your host family to take packed lunches along to work. After lunch, the children will take a nap. You’ll use this time to discuss lesson plans and activities with your teacher and fellow volunteers. 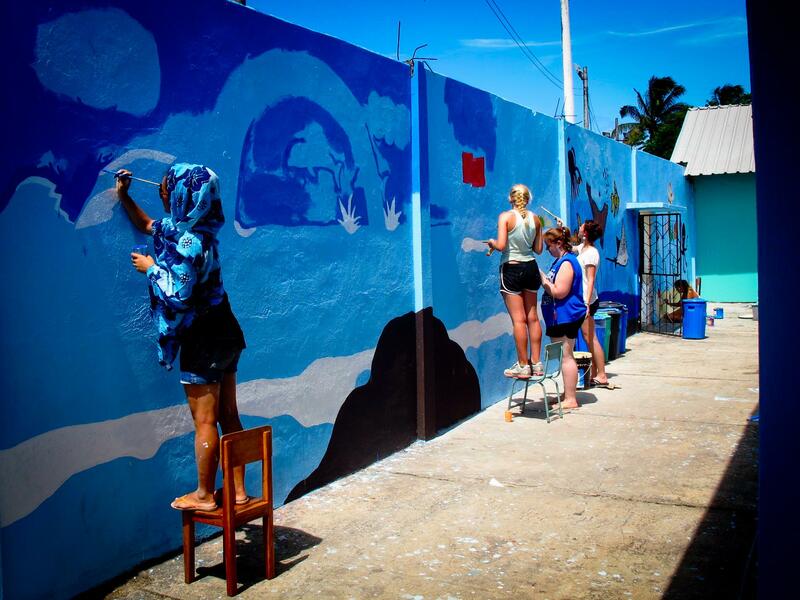 We welcome input and fresh ideas from all those who volunteer with children in Ecuador. Spend the last bit of the afternoon playing games or doing sports outside with the children. This will help them get rid of some of their extra energy before heading home! Evenings and weekends are your free time to relax and explore with fellow volunteers or new local friends. You can also use this time to do an add-on Spanish Language Course to improve your own language skills. The main aim of this project is to improve early childhood development in Galapagos. 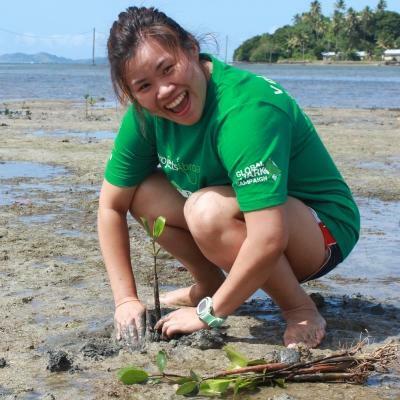 Our volunteers play a vital role in helping children reach developmental goals for their age. We work with kindergartens that are understaffed and have limited funding. As a volunteer, you will help support teachers and work with with them to identify the needs of each child. To do so, we train you how to use our early childhood development checklists. You’ll input this data into our Global Impact Database, which we use to track children’s progress. 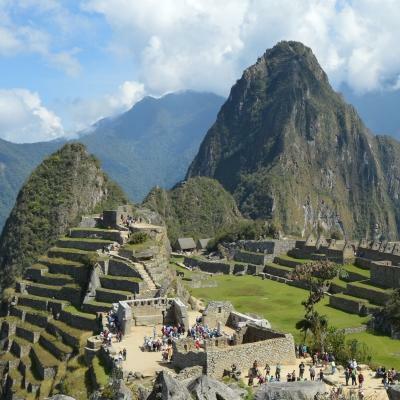 Ecuador is also a popular tourist destination, so we also focus teaching English. Good English skills help people find employment, so we try to give children a solid foundation. This also helps them cope once they start learning English formally at school. Teachers also benefit from practicing English with you, and they use any materials like flash cards created by volunteers. Our hope is to help lay a strong foundation for these children to build on, becoming confident students with exciting future prospects. Help us to achieve this by joining us as a Childcare volunteer in Ecuador. It was amazing to see the progress the children made over the month that I was there. They are so young but they learn so much, so quickly and it was such a great feeling knowing that I had been able to help them.